Yoga is an ongoing investigation and opportunity to explore the deeper realms of ourselves and it’s a process for understanding how to reach our fullest potential. Whether you’ve been practicing for one year or thirty years, this inner quest can bring peace, tranquility and knowledge. Embracing these basic values is the starting point for becoming a great yoga teacher. Because yoga is an on-going process for self-transformation, YOY’s teacher training program will help guide you into becoming a gifted instructor. One that has the ability to pass on ancient wisdom from our teacher and our teacher’s teachers. As an leader of yoga, you will become a role model in your community who can help to unlock the secrets to health, wellness and vitality. Along with YOY’s 200-hour program, your own personal yoga practice is of equal importance so as to gain insight into how best to share the practice with others. Our program is open to serious students interested in taking their practice to the next level to become great teachers. The program is also open to current teachers who would like to expand and deepen their knowledge of yoga. YOY’s 200-hour teacher training program will provide you with a solid foundation in the art and science of teaching yoga. Once you complete your training you will be able to register with Yoga Alliance as a Registered Yoga Teacher (RYT 200). * Expect to learn more than 70 asanas, including their alignment principles, modifications, energetic actions, variations, contraindications, risks and benefits. such as ujjayi, kapalabhati, bastrika, and nadi shodhana. that organically unfolds through pacing, tempo and duration. * Expect to learn Meditation Practices and explore how to bring meditation into yoga classes and off the mat into everyday life. * Expect to learn about the subtle body and the energy system of bandhas and the elements of yogic anatomy, including koshas, chakras, nadis, vayus, gunas, and doshas. * Expect to learn how to clearly define, design, and present a class with an arc flow of structured content. * Expect to learn the art of hands–on adjustments, an essential tools in helping students to master their physical body. 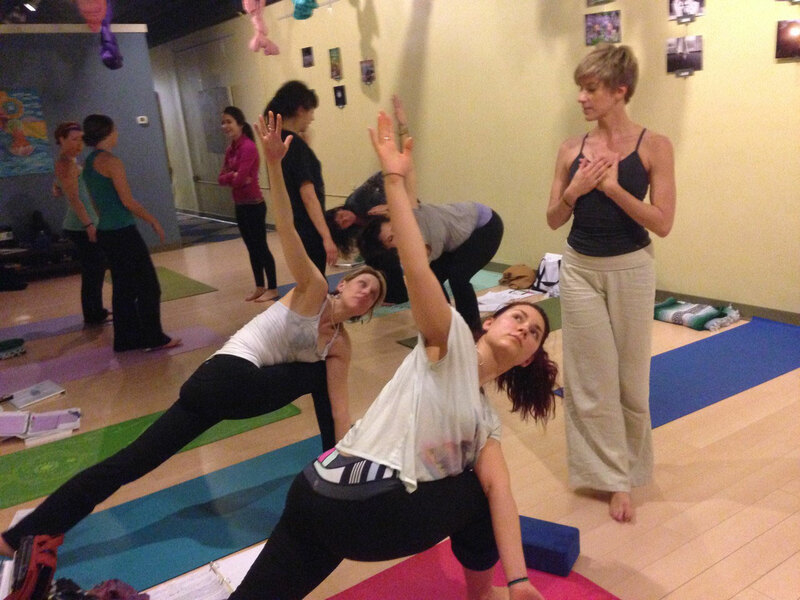 * Expect to develop an appreciation for the different styles of yoga and different teaching methodologies. * Expect to learn how to work with basic injuries, pregnancy and other specific student needs. * Expect many discussions on yoga philosophy, yoga ethics, history and wisdom of yoga and Patanjali’s Yoga Sutras. * Expect to learn the basics of opening a yoga studio and running a business. * Expect to learn how to develop a theme-centered class according to seasonal changes, etc. * Expect to observe many yoga classes and assist through an apprenticeship programs at YOY. This part of the program is the most extensive as you will learn in detail at least 75 major poses, including alignment principles, energetic actions, risks, benefits, preparatory asanas, counterposes, variations, modifications, hands-on adjustments, and use of props for each one. We will be covering a variety of sun salutations, standing poses, backbends, forward bends, twists, arm balances, inversions, core refinement, and hip openers. An overview of Patanjali’s Yoga Sutras and the eight limbs of Yoga. Also, an overview of the Bhagavad Gita. A hands-on introduction to functional anatomy, bio-mechanics, and the kinesiology of movement as applied to seeing students in the practice and guiding them in a meaningful, safe, and effective way. The art and science of sequencing asanas for different levels of students, different intentions, seasons, styles and other considerations. Here we also cover pacing, duration, tempo, different levels and intentions of classes. How we live our lives off the mat, including personal yoga practice, nutrition, sleep, relations with family and friends, and being in community are essential aspects of deepening our yoga and sharing it with dignity and integrity. Buy observing experienced teachers in their classes, you will further refine your insights into what different students are likely experiencing in their yoga practices, thereby expanding your own skills in leading classes. Be prepared to work with other participants to teach classes, starting with working one-on-one and gradually developing the confidence and skill to lead classes. Each practice teaching session includes extensive feedback and discussion of teaching techniques and methods. Tuition for the 200-hour Program is $2199. Our training program meets on weekends only. 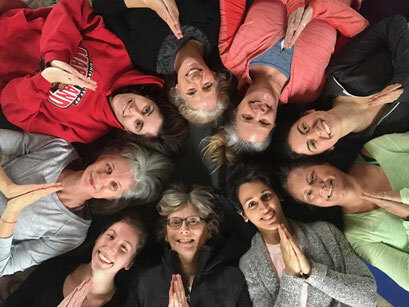 Here what some of our newly minted graduates (2017-18) from Yoga On York's 200 Hour Teacher Training have to say about the program! ...and here's a glimpse of our 2013 graduates! !